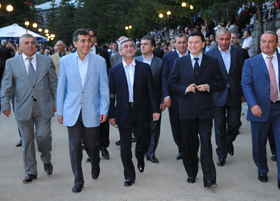 The opening ceremonies were a spectacular event, covered live on Armenia’s Public TV channel and witnessed by nearly 3000 people who crowded around the central pond in the quaint center of Jermuk, Armenia. 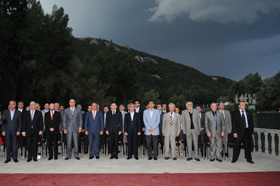 Spectators were treated to a variety of live songs, a retrospective short film about World Champion Tigran Petrosian, speeches by the President of Armenia Serge Sargsyan and President of FIDE Kirsan Iljumdzhinov as well as a clip documenting the last two Olympiad victories by Armenia’s national team. 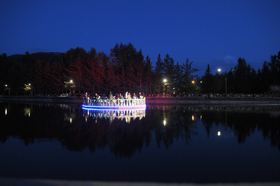 The participants had a unique vantage point, viewing the entertainment while cruising around the pond on a motorized raft while enduring the evening cold temperatures. The drawing of the lots took place on the raft itself, and after a final vocal presentation, the participants steered back to dry land to return to their rooms and get ready for round 1, which will begin at 3:00PM local time (GMT+4).